It has been a rollercoaster few months but the proposal for a footbridge over the Thames alongside the Wandsworth railway bridge is now recommended for approval by the planning authority. LB Hammersmith & Fulham expect to put the scheme to their committee in July, again with a recommendation for approval, and then the application will be referred to the Mayor for a final decision. 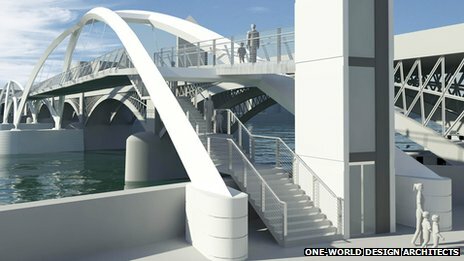 The £22m bridge will take cyclists and pedestrians between Chelsea Harbour and Lombard Road, Battersea. Projected costs are in the order of £20m. This entry was posted in Battersea and tagged Jubilee Bridge by Blogger. Bookmark the permalink.